The United Nations Development Programme (UNDP) released its Human Development Report 2011. It “argues that the urgent global challenges of sustainability and equity must be addressed together – and identifies policies on the national and global level that could spur mutually reinforcing progress towards these interlinked goals“. In this report, there is a ranking, the Human Development Index (HDI). The HDI is a way to measure the development. It combines indicators in three main dimensions: health, education and living standards. The mathematical way used to combine these indicators is explained in a technical note (PDF). The interest is of course to have a single number to use in comparison for both social and economic development. It’s not the only element to take into account to compare development. It’s merely a starting point giving an overview of development. An in-depth discussion about development and comparison between countries will need to go further and analyze each indicator separately (as well as other indicators if possible). For information, China is 101st with an HDI of 0.687 ; Vietnam is 128th with an HDI of 0.593 ; India is 134th with an HDI of 0.547 (all three in the group of medium human development countries). The UNDP also has a data explorer tool à-la-Gapminder. Yesterday, I wrote about Hans Rosling’s talk urging us to continue to improve child survival in order to curb the world population growth. If I plot the HDI -vs- the “under-five mortality rate per 1,000 live births” (the probability of dying between birth and exactly age 5, expressed per 1,000 live births), I get the following graph that intuitively makes sense: the smaller is your under-5 mortality rate, the bigger is your HDI (meaning the country is more developed). 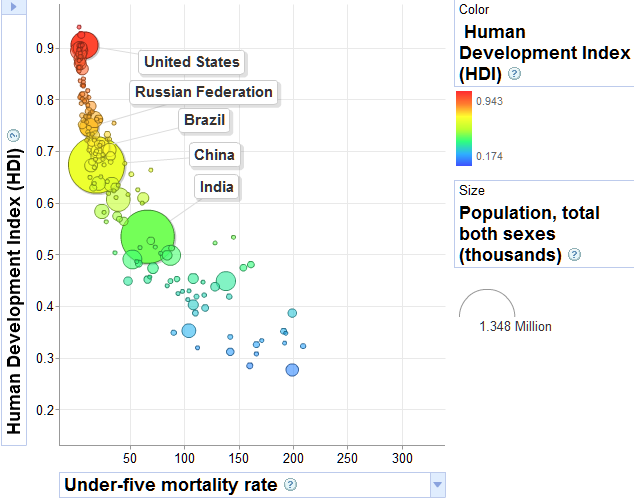 Now the HDI is admittedly a theoretical value: it doesn’t take into account inequalities within each specific country. That’s the reason why the UNDP created in 2010 the Inequality-adjusted Human Development Index (IHDI). The IHDI is thus the actual level of human development (taking into account inequality). The average loss in the HDI due to inequality is about 23%. 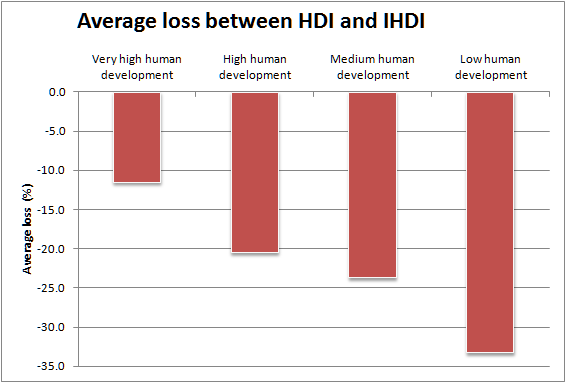 And although the loss is variable from country to country, it increases on average when you go down the human development index (HDI), see figure below. This average loss is the smallest in Europe and Central Asia (-12.7%) and the biggest in Sub-Saharan Africa (-34.5%). Today, 11th of July 2011, is World Population Day. 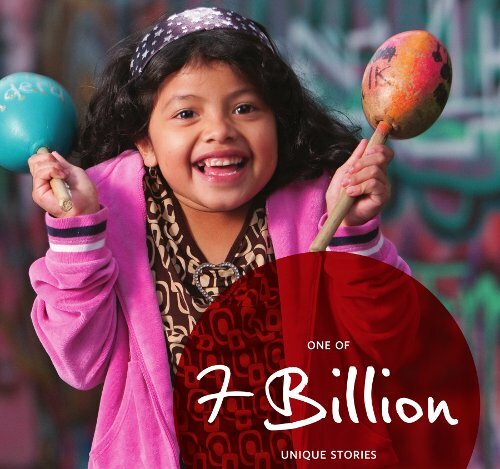 For that occasion, and as the world population is expected to surpass 7 billion this year, the UNFPA is launching a new campaign: 7 billion people – 7 billion actions. Poverty and inequality: reducing poverty and inequality also slows population growth. Women and girls: unleashing the power of women and girls will accelerate progress on all fronts. Young people: energetic and open to new technologies, history’s largest and most interconnected population of young people is transforming global politics and culture. Reproductive health and rights: ensuring that every child is wanted and every childbirth safe leads to smaller and stronger families. Environment: all 7 billion of us, and those who will follow, depend on the health of our planet. Ageing: lower fertility and longer lives add up to a new challenge worldwide: providing for aging populations. Urbanization: the next two billion people will live in cities, so we need to plan for them now. These issues are not new. They are not even original: most bodies or meetings looking at issues for the future have approximately the same issues. But at least it’s another initiative to raise awareness, to think about them. And, most importantly, to act to tackle them. I don’t think it’s wishful thinking to write that everyone can help. Besides being in the introduction brochure, teaching a child to read, planting a tree, visiting a senior, finding a cure, standing up for others and making someone smile are all simple actions we can do (even if we can’t do all of them, we can do some of them). We can start with our own kids, our own family, our own environment. What will be your unique story? TB stands for tuberculosis. It’s an infectious bacterial disease caused by Mycobacterium tuberculosis, which most commonly affects the lungs. It is transmitted from person to person via droplets from the throat and lungs of people with the active respiratory disease. Like all other World Days regarding infectious diseases, it is meant to raise awareness about its global epidemiological aspects and the efforts to eliminate it. For tuberculosis, March 24th was chosen because Robert Koch first described Mycobacterium tuberculosis on March 24th, 1882. He then received the Nobel Prize in Physiology or Medicine for this in 1905. On the WHO website, there is a huge amount of data that can be easily parsed (here too). I was first interested in the estimated TB incidence per 100 000 population in 2009 (per 100,000 population) in the BRIC countries (see table below). Clearly, there is Brazil with a low incidence (compared to others, it’s still around 10 times values found for “occidental” countries) then Russia and China around 100 cases/y and finally 168 cases/y for India. I added their respective Gross Domestic Product (GDP) in the table as it’s often considered as an indicator of a country’s standard of living (in 2009, numbers from Wikipedia/IMF). I also added the annual growth rate of GDP per capita (in 2006, numbers from EarthTrends/World Resources Institute). The only interesting thing I see is that if your annual growth of GDP per capita is low, your estimated TB incidence per 10,000 is also low. Now if we look at some occidental countries (table below, same sources), this seems right. The treatment involves medications for long period and is usually accompanied by antibiotics. Regarding prevention, Bacille Calmette Guerin (BCG) is the only current vaccine for tuberculosis and contains a live attenuated (weakened) strain of Mycobacterium bovis. TB eradication is part of the UN Millenium Development Goals (Target 6c: Have halted by 2015 and begun to reverse the incidence of malaria and other major diseases). It is also part of the WHO Global Plan to Stop Tuberculosis. I continue in the serie of “World x Day” and for a reason still unknown even to myself, I thought today was the World Epilepsy Day (it’s in fact on March 26th, called Purple Day). But, anyway, epilepsy is “a common chronic neurological disorder characterized by seizures. […] Epilepsy is usually controlled, but cannot be cured with medication, although surgery may be considered in difficult cases.” (Wikipedia). According to Wikipedia, the next World [Infectious Disease] Day is on APril 25th (malaria). It doesn’t seem jolly but last Friday, it was the World Cancer Day. About this, the WHO set up a nice website about cancer control. These figures represent cases of cancer and not deaths by cancer. Note also that prostate cancer is in third position but only concerns males. The classification is quite good since it uses the “Classification Internationale des Maladies” which is the “International Classification of Diseases” in English better known as ICD-10 (online). The conference about scientific patents was part of Second Nature, (scientific journal) Nature’s home in the virtual world of Second Life. Following their description, Second Nature is home to scientific exhibitions, ongoing projects and regular events. The conference in itself was given in November 2007 but, unfortunately, nor slides nor podcast are available. In real life, if you miss a conference, you still have a copy of the slides or, at least, the abstract 😉 . In the second part of my post, I was wondering if contacts were better in virtual worlds and if the quality standard of most “real world” scientific events was still there. But since this particular event was organized by a Closed Access journal on a semi-closed virtual world, I will wait for more events of this kind before forming an opinion on these events (current educational events in Second Life doesn’t seem to be too serious …). While looking for pictures related to patents, I found these interesting ones taken by Daneel Ariantho on Flickr. They depict a virtual conference about scientific patents. It could be interesting to get more information about 1) the content of this conference and 2) the kind of conferences organized in these virtual worlds. It could also be interesting to see the social aspects of these conferences (are your contact better/different in a virtual conference?) and the “quality control” (of speakers, of posters, of advertizers, …).